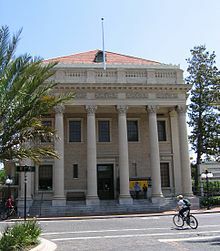 Gainesville is the county seat and largest city in Alachua County, Florida, United States, and the principal city of the Gainesville, Florida Metropolitan Statistical Area (MSA). The population of Gainesville in the 2017 US Census estimates was 132,249, a 6.4% growth from 2010. 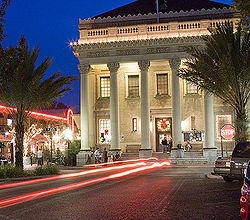 Gainesville is the largest city in the region of North Central Florida. It is also a component of the Gainesville-Lake City Combined Statistical Area, which had a 2013 population of 337,925. The Cade Innovation and Invention Museum at Depot Park. Gainesville is home to the University of Florida, the nation's fifth-largest university campus by enrollment, as well as to Santa Fe College. Gainesville is the only city with more than 10,000 residents in the Gainesville, Florida Metropolitan Statistical Area (Alachua and Gilchrist counties), and it is surrounded by rural area, including the 21,000-acre (8,500 ha) wilderness of Paynes Prairie on its southern edge. The city is characterized by its medium size and central location, about 90 minutes' driving time from either Jacksonville or Orlando, two hours from Tampa, and five hours from either Atlanta or Miami. The area is dominated by the University of Florida, which in 2008 was the third-largest university by enrollment in the US, and as of 2016 was the fifth-largest. Gainesville's climate is defined as humid subtropical (Köppen: Cfa). Due to its inland location, Gainesville experiences wide temperature fluctuations for Florida, and it is part of USDA Plant hardiness zone 9a. During the hot season, from roughly May 15 to September 30, the city's climate is similar to the rest of the state, with frequent afternoon thunderstorms and high humidity. Temperatures range from the low 70s (21–23 °C) at night to around 92 °F (33 °C) during the day on average. The all-time record high of 104 °F (40 °C) was reached on June 27, 1952. From November through March, however, the Gainesville area has a climate distinct from much of peninsular Florida with 16 nights of freezing or below temperatures and sustained freezes occurring every few years. The all-time record low of 6 °F (−14 °C) was reached on February 13, 1899, and the city experienced light snow and freezing rain on Christmas Eve, 1989. Traces of snow were also recorded in 1977, 1996, 2010 and 2016. The daily average temperature in January is 54.3 °F (12.4 °C); on average, the window for freezing temperatures is December 4 through February 24, allowing a growing season of 282 days. As with the rest of the state, cold temperatures are almost always accompanied by clear skies and high pressure systems; snow is therefore rare. Temperatures reaching 100 °F (38 °C) or falling below 20 °F (−7 °C) are rare, having respectively occurred on June 16, 2015 and January 11, 2010. The city's flora and fauna are also distinct from coastal regions of the state, and include many deciduous species, such as dogwood, maple, hickory and sweet gum, alongside palms, live oaks, and other evergreens. Thus the city enjoys brief periods of fall color in late November and December (though hardly comparable to areas further north) and a noticeable, prolonged spring from mid-February through early April. This is a generally pleasant period, as colorful blooms of azalea and redbud complement a cloudless blue sky, for this is also the period of the lowest precipitation and lowest humidity. The city averages 47.33 inches (1,200 mm) of rain per year. June through September accounts for a majority of annual rainfall, while autumn and early winter is the driest period. Since the 1990s, suburban sprawl has been a concern for a majority of the city commissioners. The "New Urbanization" plan to gentrify the area between historic Downtown and the University of Florida may slow the growth of suburban sectors and spark a migration toward upper-level apartments in the inner city. The area immediately north of the university is also seeing active redevelopment. Many gentrification plans rely on tax incentives that have sparked controversy and are sometimes unsuccessful. University Corners, which would not have been proposed without a $98 million tax incentive program by the city, was to be "a crowning jewel of the city's redevelopment efforts", 450 condos and hotel units and 98,000 square feet (9,100 m2) of retail space in eight stories covering three city blocks, on 3.4 acres (1.4 ha) purchased for $15.5 million. 19 thriving businesses were demolished in April 2007, but in May 2008 deposit checks were refunded to about 105 people who reserved units, and in July 2008 developers spent "$120,000 to beautify the site, so we won't have this ugly green fence." Gainesville's east side houses the majority of the city's African-American community, while the west side consists of the mainly student and white resident population. West of the city limits are large-scale planned communities, most notably Haile Plantation, which was built on the site of its eponymous former plantation. The destruction of the city's landmark Victorian courthouse in the 1960s, which some considered unnecessary, brought the idea of historic preservation to the community's attention. The bland county building that replaced the grand courthouse became known to some locals as the "air conditioner". Additional destruction of other historic buildings in the downtown followed. Only a small handful of older buildings are left, like the Hippodrome State Theatre, at one time a federal building. Revitalization of the city's core has picked up, and many parking lots and underutilized buildings are being replaced with infill development and near-campus housing that blend in with existing historic structures. There is a proposal to rebuild a replica of the old courthouse on a parking lot one block from the original location. 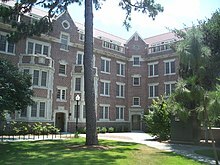 Additionally, the University of Florida Campus Historic District, consisting of 11 buildings and 14 contributing properties, lies within the city's boundaries. Most of the buildings in the Campus Historic District are constructed in variations of Collegiate Gothic architecture, which returned to prominence in the late 19th and early 20th centuries. Numerous guides such as the 2004 book Cities Ranked and Rated: More than 400 Metropolitan Areas Evaluated in the U.S. and Canada have mentioned Gainesville's low cost of living. The restaurants near the University of Florida also tend to be inexpensive. The property taxes are high to offset the cost of the university, as the university's land is tax-exempt. But the median home cost is slightly below the national average, and Gainesville residents, like all Floridians, do not pay state income taxes. The city's job market scored only 6 points out of a possible 100 in the Cities Ranked and Rated guide, as the downside to the low cost of living is an extremely weak local job market that is oversupplied with college-educated residents. The median income in Gainesville is slightly below the U.S. average. Gainesville heavily promoted solar power by creating the first feed-in tariff (FIT) in the United States. The FIT allowed small businesses and homeowners to supply electricity into the municipal power grid and paid a premium for the clean, on-site generated solar electricity. The FIT started with a rate of $0.32 per kilowatt-hour and allowed a person or business to enter into a 20-year contract where Gainesville Regional Utilities would purchase the power for 20 years. The FIT ended in 2013, when the rate was set at $0.18 per kWh, but the city is still seen as a leader in solar power. This increase in solar installations put Gainesville at number 5 in the world in solar installed per capita, beating Japan, France, China and all of the US. The sports drink Gatorade was invented in Gainesville in the 1960s as a means of refreshing the UF football team. UF still receives a share of the profits from the beverage, but Gatorade's headquarters are now in Chicago. The Gainesville urban area is served by Alachua County Public Schools, which has 75 different institutions in the county, most in the Gainesville area. Gainesville is also home to the University of Florida and Santa Fe College. The University of Florida is a major financial boost to the community, and UF athletic events, including SEC football games, create hundreds of thousands of dollars in additional revenue. In all, UF contributes nearly $9 billion annually to Florida's economy and is responsible for more than 100,000 jobs. Gainesville began desegregating its schools in the 1960s. It integrated its high schools from 1968 to 1970. Its black schools were either closed or integrated. 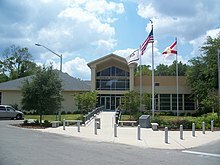 The Alachua County Library District provides public library service to a county-wide population (in 2013) of 253,451. The Library District has reciprocal borrowing agreements with the surrounding counties of Baker, Bradford, Clay, Columbia, Dixie, Gilchrist, Lafayette, Levy, Marion, Putnam, and Union. These agreements are designed to facilitate access to the most conveniently located library facility regardless of an individual's county of residence. 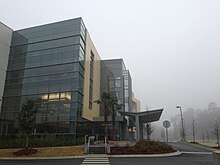 The Florida Department of Citrus's department of economic research is on the UF campus. Gainesville is administered by a 7-member city commission (four commissioners are elected by district, two are elected at large, and the mayor is elected at large). The commission and mayoral elections are nonpartisan, with a runoff if there is no majority winner. Gainesville's city hall is at 200 E University Avenue. Law enforcement is provided by Gainesville Police Department, except for the University of Florida campus which operates the University Police Department. Fire protection within the city limits is provided by the Gainesville Fire Rescue, while the surrounding county is served by the Alachua County Fire Rescue. Ambulance services are provided for the whole county by the Alachua County Fire Rescue. The mayor of Gainesville is the city's official head. Gainesville's citizens elect the mayor to a three-year term, with a two-term maximum. Since 2016 the mayor has been Lauren Poe. The National Coalition for the Homeless cited Gainesville as the 5th meanest city in the United States for its criminalization of homelessness in the Coalition's two most recent reports (in 2004 and 2009), the latter time for its meal limit ordinance. Gainesville has a number of ordinances targeting the homeless, including an anti-panhandling measure and one prohibiting sleeping outdoors on public property. In 2005, the Alachua Board of County Commissioners and the Gainesville City Commission responded by issuing a written "Ten Year Plan to End Homelessness"; which was followed by the 2010 "A Needs Assessment of Unsheltered Homeless Individuals In Gainesville, Florida" presentation to a joint meeting of Gainesville and Alachua County Commissions. An indoor homeless shelter was built on the site of the former Gainesville Correctional Institution grounds, with surrounding area designated for tents. In 2009, the Gainesville metropolitan statistical area (MSA) ranked seventh highest in the United States in percentage of commuters who biked to work (3.3 percent). Gainesville has an extensive road system, which is served by Interstate 75, and several Florida State Routes, including State routes 20, 24, and 26. Gainesville is also served by US 441 and nearby US 301, which give a direct route to Jacksonville, Ocala, and Orlando. US 441 is the main local north-south road through Gainesville. It runs on the eastern edge of the University of Florida. It is known to locals as 13th Street, before curving to the northwest and finally joining SR 20, converting into an additional hidden state road. At the intersection of SR 121, the DeSoto Trail moves from SR 121 to US 441. SR 20 runs northwest and southeast through Gainesville. In east Gainesville, the road again becomes a stand-alone four-lane highway as it heads to Hawthorne, Interlachen, and Palatka. Northwest of Gainesville, SR 20 coincides with US 441 as a hidden state road through the town of Alachua before splitting at the fork a half-mile from downtown High Springs. SR 20 then coincides with US 27 as it heads to Fort White, Branford, Mayo, Perry, and Tallahassee. SR 24 runs northeast and southwest through Gainesville. The northeast corner of SR 24 and SR 222 is the site of the Gainesville Regional Airport, before heading to Waldo, Starke, and Jacksonville (Via.U.S. Route 301)(Gainesville-Jacksonville Highway). Southwest of Gainesville, SR 24 passes through the towns of Archer and Bronson before ending at Cedar Key. SR 26 is the main local east-west road through Gainesville. West of the city, it spans from Fanning Springs to Trenton, Newberry, and Jonesville. Eastward, SR 26 heads to Melrose before reaching its terminus at Putnam Hall in Putnam County. SR 120 runs east and west through the city. Its western end is at the junction with US 441, its eastern end at the junction with SR 24. SR 121 runs north and south on the western part of the city. The DeSoto Trail breaks away as SR 121 heads north to Lake Butler, Raiford, and Macclenny. Southward, it travels to Williston before reaching its terminus at Lebanon Station. SR 222 runs east and west on the northern part of the city. Its western end of state maintenance is at the junction with I-75 before continuing as County Road 222 to County Road 241, while its eastern end is at the junction with SR 26 a few miles east of the Gainesville Regional Airport. The city's streets lie on a grid system, with four quadrants (NW, NE, SW and SE). All streets are numbered, except for a few major thoroughfares, many of which are named for the towns they lead to (such as Waldo Road (SR 24), Hawthorne Road (SR 20), Williston Road (SR 121/SR 331), Archer Road (also SR 24) and Newberry Road (SR 26)). Streets called Avenues, Places, Roads or Lanes (often remembered by use of the acronym "APRiL") generally run east-west, while other streets generally run north-south. Amtrak Thruway Motorcoach buses connect with Jacksonville to the north and Lakeland (to/from points south, LKL) to the south. Buses arrive/depart stations to connect with the Silver Service. Amtrak service is available at Palatka, 32 miles (51 km) to the east. At one time, Gainesville had railroad lines extending in six directions and was served by several depots, the earliest route reaching the town in 1859. As traffic and business patterns changed, the less heavily used railroads were abandoned beginning in 1943, and some routes realigned, with the last trains running in the middle of Main Street in 1948. Passenger service included different Atlantic Coast Line Railroad (ACL) trains: the Havana Special, the West Coast Champion from New York City, and the Dixie Flyer from Chicago. Chicago service was furnished by a transfer at Jacksonville to the West Coast Champion. In 1967, the service continued on through Seaboard Coast Line Railroad which was created as a merger of ACL and Seaboard Air Line. Service into Gainesville ended by the time of Amtrak's 1971 creation. By the 1980s, the only freight operator into the city was the Seaboard System (formerly the Seaboard Coast Line Railroad, now merged into CSX). In addition to its extensive road network, Gainesville is served by Gainesville Regional Transit System, or RTS, Florida's fourth-largest mass transit system. The area is also served by Gainesville Regional Airport in the northeast part of the city, with daily service to Atlanta, Miami, and Charlotte, North Carolina. Gainesville is known for its support of the visual arts. Each year, two large art festivals attract artists and visitors from all over the southeastern United States. Cultural facilities include the Florida Museum of Natural History, Harn Museum of Art, the Hippodrome State Theatre, and the Curtis M. Phillips Center for the Performing Arts. Smaller theaters include the Acrosstown Repertory Theatre (ART), Actors' Warehouse, and the Gainesville Community Playhouse (GCP). GCP is the oldest community theater group in Florida; in 2006, it christened a new theater building. The presence of a major university enhances the city's opportunities for cultural lifestyles. The University of Florida College of the Arts is the umbrella college for the School of Music, School of Theatre and Dance, School of Art and Art History, and a number of other programs and centers including The University Galleries, the Center for World Art, and Digital Worlds. Collectively, the College offers many performance events and artist/lecture opportunities for students and the greater Gainesville community, the majority offered at little or no cost. Since 1989, Gainesville has been home to Theatre Strike Force, the University of Florida's premier improv troupe. Gainesville also hosts several sketch comedy troupes and stand-up comedians. In April 2003, Gainesville became known as the "Healthiest Community in America" when it won the only "Gold Well City" award given by the Wellness Councils of America (WELCOA). Headed up by Gainesville Health & Fitness Centers, and with the support of Shands HealthCare and the Gainesville Area Chamber of Commerce, 21 businesses comprising 60 percent of the city's workforce became involved in the "Gold Well City" effort. 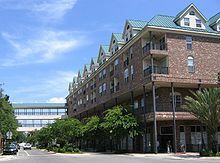 As of July 2011, Gainesville remained the only city in the country to win the award. The counties surrounding Alachua County vote strongly Republican, while Alachua County votes strongly Democratic. In the 2008 election, there was a 22% gap in votes in Alachua County between Barack Obama and John McCain, while the other 11 candidates on the ballot and write-in votes received approximately 1.46% of the vote. Gainesville is renowned in recreational drug culture for "Gainesville Green", a particularly potent strain of marijuana. Orange and Blue magazine published a feature article in 2003 about the history of Gainesville Green and the local marijuana culture in general. In the mid-1990s, several Gainesville Hemp Festivals took place outside the Alachua County courthouse. Gainesville is well known for its music scene and has spawned a number of bands and musicians, including Tom Petty and the Heartbreakers, Stephen Stills, Don Felder and Bernie Leadon of The Eagles, The Motels, Against Me!, Charles Bradley, Less Than Jake, Hot Water Music, Loyal Revival, John Vanderslice, Sister Hazel, Hundred Waters, and For Squirrels. It is also the location of independent labels No Idea Records and Elestial Sound, and the former home of Plan-It-X Records, which moved to Bloomington, Indiana. For two years, the Gainesville nonprofit Harvest of Hope Foundation hosted the Harvest of Hope Fest in St. Augustine. Gainesville is also the home of www.FLAROCKS.com, the founders of "Santa Jam", who hold concerts every December throughout North Florida as a toy fundraiser for sick, injured, and homeless children and a showcase for local musicians. Since 2011 they have distributed nearly 700 toys to hospitals, local churches, homeless charities, and needy families across the area. No Idea Records puts on an annual three-day rock festival known as The Fest, typically during the last weekend in October, coinciding with the annual Florida-Georgia football game, played in Jacksonville to minimize tensions between the largely out of town music festival goers with the University of Florida students and alumni. Between 1987 and 1998, Gainesville had a very active rock music scene, with Hollywood star River Phoenix having the local club Hardback Cafe as his main base. Phoenix's band Aleka's Attic was a constant feature of the rock scene. The Phoenix family is still a presence in Gainesville, with Rain Phoenix's band Papercranes and Liberty Phoenix's store, Indigo. Gainesville is still known for its strong music community and was named "Best Place to Start a Band in the United States" by Blender magazine in March 2008. The article cited the large student population, cheap rent, and friendly venues. Gainesville's reputation as an independent music mecca can be traced back to 1984 when a local music video station was brought on the air. The station was called TV-69, broadcast on UHF 69 and was owned by Cozzin Communications. The channel drew considerable media attention thanks to its promotion by Bill Cosby, who was part owner of the station when it started. TV-69 featured many videos by punk and indie-label bands and had several locally produced videos ("Clone Love" by a local parody band, and a Dinosaur Jr. song). 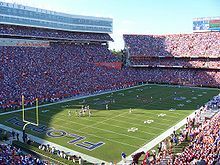 The Florida Gators is the varsity team of the University of Florida, competing in the Southeastern Conference of the National Collegiate Athletic Association since 1933. It has been ranked in the top 10 in the NACDA ranking since the 1983–84 season. It has won 40 national team championships, including two men's basketball titles, three football titles, four men's golf titles, and seven women's tennis titles. Opened in 1969, the Gainesville Raceway is a dragstrip that hosts the Gatornationals, one of the four NHRA major races. Roughly since the 2006 founding of Grooveshark, a Gainesville-based music streaming service, Gainesville has seen an increase in the number of technology-based startup companies founded and developed in the city, particularly the downtown area. Among them are Digital Brands, SharpSpring, Fracture, Optym, and Feathr. The city celebrates Josh Greenberg Day annually in April, in honor of the late founder of Grooveshark and his contributions to the community's startup culture. The Spring Arts Festival, hosted each year, usually in early April, by Santa Fe College (formerly Santa Fe Community College), is one of the three largest annual events in Gainesville and known for its high-quality, unique artwork. The nationally recognized Downtown Festival and Art Show, hosted each fall by the City of Gainesville, attracts award-winning artists and a crowd of more than 100,000. The Fest, a multi-day, multiple-venue underground music festival held annually in Gainesville since 2002. Gainesville is the 162nd-largest television market in the nation, as measured by Nielsen Media Research. Broadcast television stations in the Gainesville market include WCJB, an ABC/CW affiliate in Gainesville; WGFL, a CBS affiliate broadcasting from High Springs; WNBW, a NBC affiliate in Gainesville; WOGX, a Fox owned-and-operated station from Ocala; WMYG-LP, an analog MyNetworkTV affiliate broadcasting from Lake City; and WUFT, the PBS station affiliated with the University of Florida in Gainesville. ^ Cunningham, Ron. "Gville can!". The Gainesville Sun. Retrieved January 19, 2018. ^ "Airport Codes". Retrieved January 19, 2018. ^ a b "City Of Gainesville > City Commission". Cityofgainesville.org. Retrieved October 23, 2017. ^ "Gainesville, Florida". Weather Underground. Retrieved July 22, 2007. ^ "Annual Estimates of the Resident Population for Incorporated Places: April 1, 2010 to July 1, 2012". U.S. Census Bureau. Archived from the original on October 19, 2013. Retrieved June 1, 2015. ^ "Population estimates, July 1, 2017, (V2017)". Archived from the original on July 10, 2012. Retrieved September 11, 2018. ^ a b "Geographic Identifiers: 2010 Demographic Profile Data (G001): Gainesville city, Florida". U.S. Census Bureau, American Factfinder. Retrieved May 6, 2013. ^ "U.S. Census Data 2013". February 5, 2015. Archived from the original on July 10, 2012. Retrieved February 22, 2015. ^ "University of Florida Facts". University of Florida. Archived from the original on May 20, 2011. Retrieved May 18, 2011. ^ "Ohio State named nation's largest college – again". Dayton Business Journal. October 20, 2008. Retrieved June 30, 2011. ^ a b "Monthly Averages for Gainesville, Florida". The Weather Channel. Archived from the original on October 23, 2007. Retrieved July 22, 2007. ^ a b c d e "NowData - NOAA Online Weather Data". National Oceanic and Atmospheric Administration. Retrieved March 22, 2018. ^ "Gainesville Records for February". National Weather Service. Retrieved July 21, 2007. ^ Kneale, Dennis (January 19, 1977). "Snow in Gainesville? Here's what it looked like in 1977". The Independent Florida Alligator. Retrieved December 9, 2018. ^ Alexander, Jackie (December 26, 2010). "NWS confirms Sunday morning snow flurries for Gainesville". The Gainesville Sun. Retrieved September 30, 2018. ^ Callahan, Joe (January 3, 2018). "Snow in Gainesville? Could happen Wednesday". Gainesville Sun. Retrieved December 9, 2018. ^ "Station Name: FL GAINESVILLE RGNL AP". National Oceanic and Atmospheric Administration. Retrieved March 22, 2018. ^ a b Randy Jewett. "City shouldn't pay for University Corners". Alligator.org. Retrieved October 17, 2017. ^ KATIE GALLAGHER. "Court case makes future uncertain for University Corners". Alligator.org. Retrieved October 17, 2017. ^ JEFF ADELSON. "Will University Corners see daylight?". Gainesville.com. Retrieved October 17, 2017. ^ Anthony Clark. "Work on Stadium Club to resume; University Corners still on hold". Gainesville.com. Retrieved October 17, 2017. ^ a b c Megan Rolland. "University Corners cleans up for church". Gainesville.com. Retrieved October 17, 2017. ^ APRIL DUDASH. "Developers of stalled University Corners complex return checks". Alligator.org. Retrieved October 17, 2017. ^ "Innovation Square » Innovation Square. Innovation and Community Redefined". Innovationsquare.ufl.edu. Retrieved October 5, 2016. ^ Curry, Christopher (December 3, 2012). "University Corners project back before the city". Gainesville.com. Retrieved June 7, 2015. ^ "The Continuum Apartments". Thecontinuumforufgrads.com. Retrieved October 5, 2016. ^ Morgan Watkins. "12-story hotel may soon rise from city parking lot". Gainesville.com. Retrieved October 5, 2016. ^ "U.S. Decennial Census". Census.gov. Archived from the original on May 12, 2015. Retrieved June 1, 2013. ^ "State and County QuickFacts Gainesville (city), Florida". U.S. Census Bureau. Archived from the original on July 10, 2012. Retrieved June 20, 2012. ^ "Data Center Results". Mla.org. Retrieved June 20, 2016. ^ "Gainesville, Florida Solar Power Feed-In Tariff Program Maxed Out Before It Begins". Treehugger.com. Retrieved June 20, 2016. ^ Curry, Christopher (December 19, 2013). "City Commission will not add to feed-in tariff in 2014". Gainesville.com. Retrieved June 7, 2015. ^ Farrell, John (January 6, 2012). "Gainesville, Florida, Becomes a World Leader in Solar". CleanTechnica. Retrieved June 7, 2015. ^ "City of Gainesville CAFR" (PDF). Cityofgainesville.org. Archived from the original (PDF) on August 2, 2018. Retrieved August 2, 2018. ^ Florida, University of. "03 » Study finds UF has $8.76 billion economic impact on Florida » University of Florida". Archived from the original on July 1, 2014. Retrieved June 20, 2016. ^ "Contact" (Archive). Florida Department of Citrus. Retrieved on September 13, 2015. 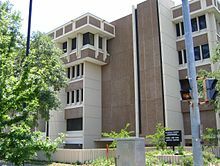 "Florida Department of Citrus Economic Research 2125 McCarty Hall – University of Florida Gainesville, Florida 32611-0249 USA"
^ "Municode Library". library.municode.com. Retrieved January 15, 2019. ^ "Mayor Lauren Poe". www.cityofgainesville.org. Retrieved January 15, 2019. ^ a b c d e f g h Lawrence Kestenbaum (ed.). "Mayors of Gainesville, Florida". Political Graveyard. Retrieved April 20, 2017. ^ "City Commission". Gainesville, Florida Official Homepage. Archived from the original on December 5, 2000 – via Internet Archive, Wayback Machine. ^ "Illegal to be Homeless". National Coalition for the Homeless. November 2004. Retrieved July 22, 2007. ^ ROBERTA O. ROBERTS. "City named fifth meanest to homeless". Alligator.org. Retrieved October 17, 2017. ^ "Parks as soup kitchens – Under The Sun - Gainesville Sun". October 30, 2011. Archived from the original on October 30, 2011. Retrieved October 17, 2017. ^ "Ten Year Plan to End Homelessness" (PDF). Alachua County Commission. Archived from the original (PDF) on July 11, 2007. Retrieved July 22, 2007. ^ ""Alachua County/City of Gainesville Quarterly Special Meeting — Meeting Agenda August 30, 2010"" (PDF). Meetingdocs.alachuacounty.us. Retrieved July 7, 2011. ^ "Indoor homeless shelter opens Wednesday". Gainesville.com. Retrieved October 8, 2015. ^ DAVE SCHLENKER. "Time to raise the curtains". Gainesville.com. Retrieved October 17, 2017. ^ "College of the Arts - University of Florida". Arts.ufl.edu. Retrieved June 20, 2016. ^ "Gainesville Goes Gold!". The Wellness Councils of America. May 2003. Archived from the original on May 14, 2008. Retrieved April 21, 2008. ^ "County Results–Election 2008". CNN. November 7, 2008. Retrieved March 13, 2009. ^ "Official Results — General Election — November 4, 2008 — Summary For Jurisdiction Wide, All Counters, All Races" (PDF). Alachua County Supervisor of Elections. Archived from the original (PDF) on September 27, 2011. Retrieved July 24, 2011. ^ Battey, Brandon (Fall 2003). "Gainesville Green isn't just a color". Orange and Blue". Archived from the original on July 4, 2007. Retrieved July 22, 2007. ^ "Harvest of Hope Festival". No Idea Records. March 2009. Archived from the original on February 28, 2009. Retrieved March 3, 2009. ^ "Four arrested for punching and kicking GPD officer". The Independent Florida Alligator. November 2009. ^ "Hardback Cafe Archive". Alan Bushnell. May 2007. Archived from the original on December 31, 2008. Retrieved July 19, 2008. ^ "Liberty Phoenix's Indigo". The Gainesville Sun. May 2007. Retrieved July 19, 2008. ^ "Gainesville named best place to start a band in America". Blender Magazine. March 2008. Archived from the original on June 5, 2009. Retrieved July 19, 2008. ^ "Current Gainesville Bands". www.gainesvillebands.com. July 2008. Retrieved July 19, 2008. ^ Frankel, Ryan. "An Insider's Perspective: The Good, The Bad and The Ugly of Gainesville Startups". Business in Greater Gainesville. Retrieved November 20, 2017. ^ Schweers, Jeff (April 28, 2013). "Gainesville's Startup Alley covets UF computer grads". The Gainesville Sun. Retrieved November 20, 2017. ^ Stein, Ron. "Gainesville has become a tech hub for engineering entrepreneurs". Florida Trend. Retrieved November 20, 2017. ^ Whitely, Richard (April 20, 2016). "Gainesville Remembers Grooveshark Co-Founder With 'Josh Greenberg Day'". WUFT. Retrieved November 20, 2017. ^ "Spring Arts Festival - My WordPress Blog". Spring Arts Festival. Retrieved October 17, 2017. ^ @thefestfl. "The Fest 16 » History". The Fest 16. Retrieved October 17, 2017. ^ Levi Bradford (October 26, 2016). "Fifteen years of Fest". The Gainesville Sun. Retrieved May 4, 2017. ^ "The New York Times is relocating some wire service positions to Gainesville, creating about 25 jobs". Ocala.com. Retrieved June 20, 2016. ^ "Market Ranks and Schedule". Arbitron, Inc. Retrieved September 6, 2007. ^ "Local Television Market Universe Estimates". The Nielsen Company. Retrieved September 6, 2007. ^ Jill Lederman. "The Sensory Garden is an oasis for the blind and visually impaired". Gainesville.com. Retrieved October 17, 2017. ^ "Sister City Program of Gainesville". Sister City Program of Gainesville, Inc. Archived from the original on January 5, 2010. Retrieved December 14, 2018. Andersen, Lars (2004). Paynes Prairie: The Great Savanna: A History and Guide. Sarasota, Florida, USA: Pineapple Press. ISBN 1-56164-296-7. Retrieved May 18, 2011. Braley, R. Olin (2004). The Killing of Harmon Murray: Being a True Account of the Life and Times of Florida's Premier Black Outlaw. Gainesville, Florida: The Alachua Press. Hicks, Rob (2008). Images of America: Gainesville. Arcadia Publishing. ISBN 978-0-7385-5402-0. Hildreth, Charles H.; Merlin G. Cox (1981). History of Gainesville, Florida 1854-1979. Gainesville, Florida: Alachua County Historical Society. McCarthy, Kevin M.; Murray D. Laurie (1997). Guide to the University of Florida and Gainesville. Sarasota, florida: Pineapple Press. ISBN 1-56164-134-0. Milanich, Jerald T. (1995). Florida Indians and the Invasion from Europe. Gainesville, Florida, USA: University Press of Florida. ISBN 0-8130-1636-3. Milanich, Jerald T. (1998). Florida's Indians from Ancient Times to the Present. Gainesville, Florida, USA: University Press of Florida. ISBN 0-8130-1598-7. Milanich, Jerald T. (1999). The Timucua. Oxford, UK: Blackwell Publishers. ISBN 0-631-21864-5. Milanich, Jerald T. (2006). Laboring in the Fields of the Lord: Spanish Missions and Southeastern Indians. Gainesville, Florida, USA: University Press of Florida. ISBN 0-8130-2966-X. Newton, Michael (2001). The Invisible Empire: The Ku Klux Klan in Florida. Gainesville, Florida: The University Press of Florida. ISBN 0-8130-2120-0. Rajtar, Steve (2007). A Guide to Historic Gainesville. Charleston, South Carolina; London: History Press. ISBN 978-1-59629-217-8. Taulbee, Lindsay. "Gainesville in the '70s: Changes roiling beneath a polite Southern surface". Gainesville Magazine. Gainesville Sun. Retrieved May 13, 2011. Washington, Ray. "University of Florida: Unrest amid the boom times 1960-1980". Gainesville Sun. Gainesville Sun. Retrieved May 13, 2011.